Just the other day...tears ran down my face as I read this piece by author, Bob Hamp. I think you'll see why. May the Lord draw you closer to Him as you read these words. She hung her head a little bit lower as she walked by the pastor’s house. It didn’t happen often, but she hated when they were both out at the same time. He looked at her with such contempt. Even though this night was different, the street was familiar, and the sting of shame still tried to rise in her in these familiar places. Only two nights prior she had walked down this very street, on her way to turn the next trick in her ongoing life of shame. The contempt in the eyes of the pastor had been nothing compared to the way she looked at herself each day. Not only is this not how she had thought her life would turn out, she had once looked scornfully at the kind of women she now found herself to be. And two nights ago she walked this very street in what seemed like a never-ending, this-is-all-life-held walk of shame. He was right where he said he would be. He treated her just like she knew he would. He looked at her just like every other man did. Amazingly, that night she had thought was the next in a never-ending life turned out to be the last time ever, as her life changed completely the very next day. As she walked down the street this time, her mind drifted back to the events of the last forty-eight hours. She had awoken the next morning with a familiar numbness spreading through her soul. Her mind was going through an automatic process of deleting images from the night before. His breath, and his ugly words, the way he had touched her all left marks on her soul and she was running through her familiar process of separating from herself. It seemed to at least help her self-repulsion if she began to reject the part of her that had just betrayed her. She didn’t even realize that the way she abandoned that part of her was exactly the way her father had once abandoned her. Nevertheless she went through the process. As she slipped out of the house that morning, as always, hoping to avoid any human contact, she made her way towards the market. She had learned to avoid eye contact, whether walking through town or turning a trick. It seemed that the one thing she could not separate herself from was the mark that came from seeing the scorn and contempt in the eyes of the other. It was almost as if their gaze could somehow inject into her the very scorn they were sending her way. Seeing the eyes of the other seemed to connect their hatred to the hatred she felt for herself. So she just didn’t look up. She had washed her body, and was mentally washing her soul, when she bumped into a stranger. Rather than move aside, he stood squarely in her path, almost as if blocking her way. Dread began to rise in her. Some customers were violent and the agressiveness was evident almost right away. Was this man trying to make his move, right now, so early? “Excuse me sir,” she said softly, hoping to just keep moving and avoid an early start to her misery. “I’m sorry,” said a voice. Something started in her at the sound of his voice. The voice was very strong, and yet, clearly not aggressive. Even in the clarity and firmness of this voice she heard gentleness. And something else. She hoped to sidestep the stranger and keep moving on her way. But he didn’t budge. “I forgive you.” He said. The words struck her like a bolt of liquid lightning. It was almost as if the words themselves had substance, and they washed over her with a surprising sense of physical power. Combining a man’s voice (no, this man’s voice) with these words, which she had never heard spoken to her before, she felt her body go weak, and her mind suddenly turn. In this surprising moment she broke her number one rule. She looked up and saw His eyes. For a second, regret began to well up, but when her eyes fell on His for a moment, she suddenly became much less aware of herself, and much more aware of Him. He was looking at her. Not just looking in her direction, He was looking right at her. He wasn’t looking at her breasts, he wasn’t looking at her body, or even really, her face. He was looking at her. Perhaps even looking right through her. His eyes were piercing, and not in a steely, I-am-better-than-you sort of way, but in a I-see-who-you-really-are sort of way. She felt the urge to protect herself rise up almost uncontrollably. Not because He seemed to be dangerous, but because He seemed to see who she was. This made her overwhelmingly aware of who she thought she was. Many of the pictures she had so dutifully erased from her mind flooded back into her consciousness. As He looked intently into her eyes she wanted to hide. She wanted to hide from Him, and she wanted to hide from herself. Somehow, in the face of His steady gaze, her ability to hide just seemed paralyzed. She could not hide from Him, and she knew it. In fact her ability to hide seemed to have disappeared. She felt naked. As she gave up on her attempt to run into the dark chambers of her soul she became aware of something else. She became aware that even though it seemed He could see right through her, He wasn’t ashamed and He wasn’t disgusted. In fact He seemed to…He seemed, (no surely not) He seemed…He seemed to be fond of her. This was not a look she had ever seen before in anyone’s eyes. This was not the pseudo-affection her customers put on before they made their offer. This was not the look of the shopkeepers when she pulled out her money to pay for her purchase. This wasn’t even the look of the one friend she had once had, who seemed to understand her. This look injected into her something she had never felt. Wait, something she had never known. When He looked at her she felt valued. He began to tell her about herself. He spoke gently and sorrowfully about the family she had been born into. (How could He know these things?). He spoke with great compassion about how this family had disintegrated when her dad abandoned them. He spoke about what she had thought were secret moments, when she had been alone begging God to step into her life and help in some way. He unfolded to her a life story, her life story, as if He had been present in each of the moments He described. His words, still like a tangible force, washed over her with power and with love and with compassion. Even as He came to her present life, He told her of how she had turned to a life of prostitution, out of fear and mounting hopelessness. Without shame, and without condemnation, He described to her exactly how she ended up where she was. And then He said it to her. She had heard the words before, but they were always empty and fraught with selfishness and expectation. He told her He loved her. The words were like a warm flood. Even her parents had not been able to say these words to her. But it wasn’t just the words. It was the Man, it was His presence, it was His voice, and it was His eyes. His eyes. They just stared right into her and she knew two things at exactly the same time. She knew He knew her. And just when she thought she would collapse, He told her that He was her Father, and He wanted her to be His daughter. That she was made for more than just the life she knew, she was made to be loved by Him. He told her all this, and then stopped. He seemed to be waiting on her. “Do you want to be my daughter?”, He asked. “More than anything,” she heard herself say. Something inside of her changed. She felt the dark ball of self-hatred dissolve in a second, and she felt life quicken in her abdomen, like she imagined a pregnant woman would feel. She felt somehow clean, and cleaned out. And then He hugged her. He held her close like a good dad does with His beautiful daughter. He wasn’t trying to get something from her. He was giving Himself to her. He held her close and she felt tears fall on her cheek. They were not her tears, they were His. He stepped back and grinned at her. He spoke a few words to tell her that everything would be fine. That He would always be watching out for her, even if she didn’t see Him. Then He walked on down the street, disappearing into a crowd. Two days later, she now walked down the street in front of the pastors house. The old shame was losing it’s grip, and as she passed by she heard a voice through the window.Not just a voice, she heard that Voice. She looked in the window and saw Him. She had wondered if she would ever see Him again after that morning. A part of her had been trying to convince her that the encounter had been a dream, but she could not deny the difference on the inside of her. When she saw Him in the pastor’s house her heart leapt. He was surrounded by leaders from the church and they seemed to be asking Him questions. Before she knew it, she was standing at the door knocking. The very house she once tried to sneak past, she now stood at the door, knocking and seeking entrance. Someone opened the door, and she asked if she could come and see the Teacher. As she walked into the room, she was vaguely aware of the scornful looks from the pastors, but she was overwhelmed when Jesus looked at her and grinned. She was welcome here. Tears fell from her eyes. She could not control the rush of gratitude and love, and she collapsed at His feet. Her tears fell on His feet as she tried to find words to express her gratitude. She could find no words, so she just stayed on the floor and wept. She was grateful that she could rest in the fact that He knew what she meant. He stroked her hair and gently turned to the hard and scornful looks of the men in the room. Their faces and postures spoke, no screamed, volumes regarding how they felt about her. She was unaware, because she was overwhelmed by how He felt about her. She barely heard the story. She was so overcome with gratitude, she could not help but sit and love Him. Bob is the father of four young adults, and has been married to Jackee since 1984. 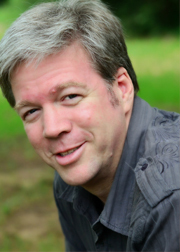 His background as a professional counselor and pastor of Freedom Ministries has been the outgrowth of a relentless curiosity to discover how things work. God saved him from a non-church background, allowing him to grow up minus much of the potential for rigid religious thought and language. 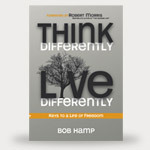 He is the author of "Think Differently, Live Differently" . Hobbies include music and trying to change the world.